[Correspondence between United States Treasury and bankers, 1811.] Printed booklet, with fold-out table, of correspondence of Albert Gallatin, Secretary of the Treasury, regarding 'several banks in which the public monies are now deposited'. 30pp., 12mo, paginated 3-32 on wove paper. With additional fold-out table on laid paper, headed 'Statement of the several Banks in which the public money is deposited, shewing the greatest amount in each Bank at any one period since the 4th March, 1811, and also the amount deposited in each Bank on the 30th September, 1811.' Lacking the title-leaf. Disbound. Worn, lightly damp-stained and loose. With 1851 blind-stamps of the Manchester Free Library. The volume consists of correspondence by Albert Gallatin, Secretary to the Treasury, with letters to him from representatives of banks. [ Panapakkam Anandacharlu, founder-member of the Indian National Congress. ] Autograph Letter Signed ('P. Anunda Charlu') to 'Mr Rees' [ later Sir J. D. Rees ]. congratulating him on his elevation to the Viceregal Legislative Council. On his letterhead, Lakeside, Egmore [ Madras, India ]. 16 October 1895. 2pp., 12mo. Bifolium. In fair condition, lightly aged and worn, with slight glue staining on blank reverse of first leaf. The letter begins: 'My dear Mr Rees. | I beg to congratulate you & myself on your elevation to a membership of the Viceregal Legislative Council – you on your well-earned elevation – myself on the pleasure of your companionship while at Calcuttah. [sic]' He is pleased to note that Rees's 'youth & the fact of your being comparatively a junior have not been regarded insuperable obstacles or unpardonable crimes'. [ Printed item. ] On Local Courts of Justice. Read at the Social Science Congress, at Birmingham, and published by permission of the Council. London: Horace Cox, "Law Times" Office, 10, Wellington Street, Strand, W.C. 1884. 12pp., 12mo. Stitched. In fair condition, lightly aged and creased, with minor staining to outer pages. In small print. Dated at end from 'Whitbourne Court, Worcester, Sept. 2.' Scarce: no other copy traced, either on OCLC WorldCat, or on COPAC. From the Harington family papers. Bulletin of the International Affairs Department, Central Committee of the Polish United Workers Party, Unity Congress, Warsaw, January 1949. 56pp., 4to. 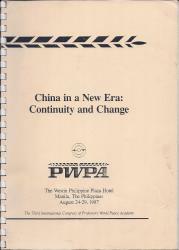 Stapled in brown printed wraps, giving details and date of the Unity Congress, and with a pencil note that the copy is one of twenty-nine. 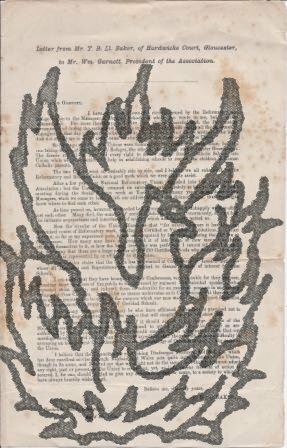 In fair condition, on lightly aged and worn paper. The first paragraph must have whipped delegates into a frenzy of anticipation: 'Comrades, | The Unification Congress is a great and happy event in the life of every working man in this country. For a long time the Polish working class has been waiting for this happy and great moment. The broad peasant masses and the working intelligentsia take great interest in this Congress. [ Thomas McKenny Hughes, Woodwardian Professor of Geology, Cambridge University. ] Autograph Letter Signed ('T McKenny Hughes') to his mother, from New Mexico, while attending the 1891 International Geological Congress, with description of 'natives'. On letterhead of the San Felipe Hotel, Albuquerque, New Mexico. 23 September 1891. Hughes's mother Margaret - wife of Rev. Joshua Hughes (1807-1889) - was the daughter of Sir Thomas McKenny (1832-1917), Lord Mayor of Dublin. According to his entry in the Oxford DNB, Hughes and his wife 'attended the International Geological Congress of 1891 in the USA, where they were part of a small group which visited the national parks of North America, including the Grand Canyon, into which descent was made from the north rim. Much of the journey was made on horseback, through territory still under Native American occupation.' 2pp., 8vo. In ink and pencil. [Pamphlet.] The Result of the Neglect of Religious Instruction in Elementary Schools. 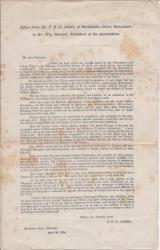 An Address delivered at the Folkestone Church Congress, Wednesday, October 5th, 1892. 4pp., 12mo. In grey printed wraps. With stamp, shelfmarks and labels of the Board of Education Reference Library, otherwise in good condition, on lightly-aged and worn paper. Scarce: no copy in the British Library or on COPAC. 18 items relating to the National Union of Agricultural Workers, from the papers of Labour MP Tom Driberg, including speeches, reports, newspaper cuttings, a letter from the NUAW Secretary, on such subjects as tied cottages, German workers, Bradwell. Most items dating from the period of the National Union of Agricultural Workers conference, 1948. Having been expelled from the Communist Party in 1941, Driberg joined the Labour Party in 1945; he would be elected to the National Executive throughout 1949-72 and was chairman of the party in 1957-8. The collection is in fair condition, on lightly-aged paper, with occasional minor rust staining from paperclips. ONE: Autograph Notes by Driberg of 'Bradwell local information'. 12pp., 12mo, on a total of eight leaves of House of Commons notepaper. Autograph Letter Signed from the New York journalist Manton Marble to Samuel Dana Horton, hoping for the pleasure of a 'Monetary Confference'. '<Warmley's?> - Wash[ingto]n'. 29 November 1885. 1p., 4to. Good, on lightly-aged paper. He has found Horton's 'card, & address' on returning from dinner, and is sorry to miss the chance of seeing him, 'but I return to New York in the limited train in the morning.' He hopes Horton will be in New York before he returns to Ohio, 'and that you will give me the pleasure of a "Monetary Conference". Marble shared Horton's interests, also in 1885 he went to Europe as a delegate to the Bi-Metallic Congress. Signed Autograph Memorandum ('Ro Greenhow') from the historian Robert Greenhow, produced as part of his duties as librarian at the Department of State in Washington, concerning a correspondence between Madison and Monroe on 'natural improvements'. 1p., 4to. Ten lines. Fair, on aged paper, with one unobtrusive closed tear. Greenhow describes the surviving correspondence concerning 'natural improvements' between Madison and Monroe, and speculates regarding a discrepancy. 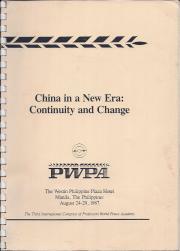 [The Westin Philippine Plaza Hotel, Manila, The Philippines, August 24-29, 1987. 68pp., printed wraps, comb binding. The programme for the Congress, with photographs of speakers, and synopses of their subjects, and other introductory matter. The discussions (or some of them?) 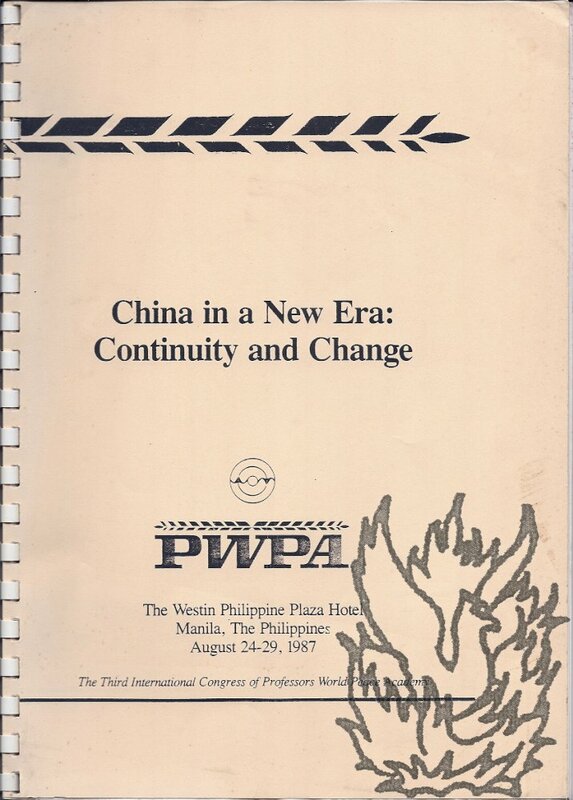 were apparently later published but COPAC records only two publications. This item is not listed on COPAC, but WorldCat lists a copy at Harvard. Perhaps a pivotal discussion of the emerging China. Revolutionary patriot, Continental Congressman and lawyer, Rhode Island (1741-1796). Two pages, 4to, damaged and soiled but text clear and complete. Summary in different hand "1784 / Case to answer in the Estate of Joseph Warton Esq., by Henry Marchant on Ist Decr. 1784" [Warton was Colonial Governor of Rhode Island.] Marchant states the problem relating to the liabilities of Warton's widow and gives his opinion as to the circumstancers in which she was answerable to the liabilities and claims.